1300 start time on Sunday (Dec 21st) so try to arrive early!! Public Transportation is your best option!!! 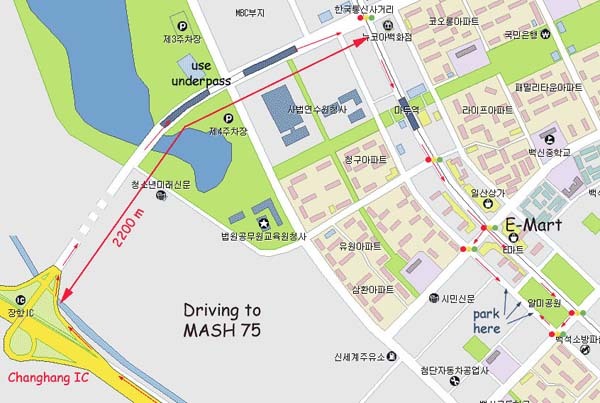 Take line 3 (the orange line) to Baekseok station (#314)(700 won), about 45 minutes from central Seoul. Leave the station by Exit 4 then keep walking in the same direction for about 500 metres to a small park. We'll be somewhere in that park. - From the center of Seoul drive west-north-west on highway 70 along the north bank of the Han river. - Zero your odometer as you pass Songsan Bridge. - Drive west past the Haengjusansang temple and past Haengju and Kimpo bridges. 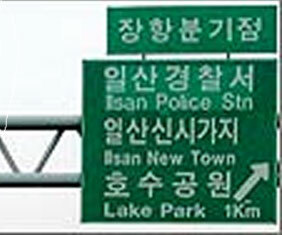 - At about 15 km, turn right off the highway at Changhang Interchange - see the direction sign for (Ilsan) "Lake Park". - At about 16.5 km you can use an underpass to save a couple of minutes. - At approx 17 km (2200 m from the IC- see map! ), turn right. - At the second traffic lights from there - with E-Mart department store on the left across the junction - you can turn right then almost immediately left. - Find a parking spot, then look for hashers in the little park. Bring some warmer clothes for the on-after!! There will be the usual snacks and drinks afterwards.